I just finished reading Disrupt Yourself by Whitney Johnson, dubbed one of the world’s most influential management thinkers in 2015. Johnson discusses many ideas on how you can challenge or disrupt yourself to fuel personal growth. 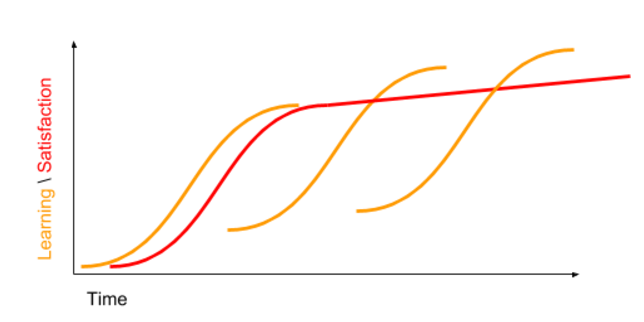 At the core of Johnson’s volume is the introduction of the s-curve: how learning or growth in a particular skill or subject can be slow at first but then if you are patient enough your learning eventually accelerates and you enjoy the ride until you hit a plateau or the top of the curve. This is when you no longer learn as much. I have come across the concept in other posts as well like the rise of expert beginner. A key concept is the satisfaction that learning imparts, especially when the s-curve or speed of learning accelerates, resulting in the production ofdopamine, which acts as a positive stimulus in the brain and motivates us to keep going. The principle here is that as knowledge workers, if we stop learning, we stagnate, no longer feel motivated and after a while we may not find our jobs as satisfying. This is especially true for those life-long and fast learners in your team who are addicted to learning. Yes, your rock stars. There is a direct correlation between job satisfaction and learning/challenge which I mapped it in the following graph. In other words, when the learning decelerates, the satisfaction slows down and decreases overtime. While moving from one s-curve (subjects that we are learning or challenges that we pick up) to another can help us improve ourselves individually, I would argue that as leaders we can use our understanding of the s-curve concept to successfully onboard new employees and retain high performers. You must have guessed what I am about to say but let me elaborate. When you are onboarding a new employee be mindful that the s-curve may move slowly at the start. Even if they are hired for a senior role, there is still a lot to learn when they join a new team: conventions, people, rules, processes, and the job.The point is to plan for a slow start and help them move up the curve by giving them incrementally more challenging tasks to get them there. Depending on their level of seniority it may take them less or more time to go through the bottom of the curve. Watch for signs and line up more challenging tasks to both increase their learning and engagement. Once onboarding has been successful and new employees are considered major contributors in a specific area or role, what’s next? How do you make sure they remain interested and keep progressing? The answer? Keep in mind the s-curve and the learning/satisfaction ratio as shown in the above diagram and stay in touch with your employees. Are you seeing signs of fatigue? Are they as interested or energized as they used to be? Do you still see a spark in their eyes? If not, it could very well be due to the fact that they are at the top of the s-curve. In other words, they are no longer learning and challenged as much as they used to be. At this point, while they may be working on different projects, it may all start to feel repetitive to them. How to solve this? Keep the dialog open and work with them to find a new curve for them to jump on as you see in the following diagram. This could be a new role, a new challenging project, a new technology to learn. The new curve should ideally be aligned with the trajectory of their north star (their career goal). While this jump to the new curve introduces some challenges for you and the team (performance may not be as high as currently, for example), it’ll be worth it for them and the business. For your employees, they gain satisfaction, learn, and be on their preferred path as well as explore other potential paths. For the business, retaining the best people is always important and developing collective intelligence in new untapped areas can be always beneficial. As a leader, you not only have a responsibility to constantly learn and disrupt yourself, but you are also responsible for the satisfaction and happiness of your employees. The best and brightest often like to disrupt themselves and helping them do this without leaving the company is a win-win.